According to a release from the UVI, the festival will feature original films created by UVI students and local film enthusiasts. 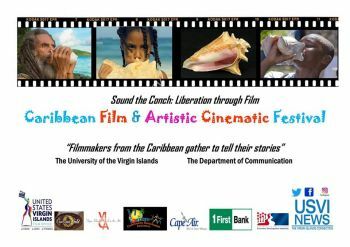 Caribbean artists and filmmakers from the Virgin Islands, Georgia, Texas, Colorado, Puerto Rico and Barbados will screen their work and host presentations. A panel of judges will select winners in several categories such as short documentaries, commercials, short video and music. UVI students and community filmmakers will be judged separately. “We have been planning this [festival] for almost three months and it’s going to be so much fun,” said Asia Vetter, a senior Communications major. The festival will also feature interactive ‘Sip and Paint’ sessions on both days. The sessions will be conducted by visual artists Don Matthews from Atlanta and Danica David from St. Croix. The general public is invited to attend this event for the cost of $20: which includes an all-day pass to morning activities and afternoon film screenings. Tickets for the ‘Sip and Paint’ sessions are $40 and cover the costs of art supplies and instruction. Interested persons may pay at the event or purchase tickets online. The proceeds from the Caribbean Film and Artistic Cinematic Festival will go toward funding media equipment and scholarships for UVI communication majors. To donate visit the UVI website www.uvi.edu. The Caribbean Film and Artistic Cinematic Festival is made possible by generous sponsors, including: U.S. Virgin Islands Department of Tourism, Virgin Islands Council on the Arts (VICA), Crucian Gold, V.I. Lottery, Cape Air, First Bank, CBS and ABC USVI News, and Economic Development Authority (EDA). For more information, contact Dr. Sharon Honore, Communication Department Chair, 225-326-4514.